Using two validated marine ecosystem models (Ecosim and the spatially-explicit individual-based model Osmose) applied to the highly productive Humboldt upwelling ecosystem, we simulate the ecological effects of fishing low trophic level groups (e.g. anchovy) on the Peruvian coastal ecosystem. Specifically, we ran some depletion experiments on anchovy, mesopelagic fish, macrozooplankton, sardine and jack mackerel. Because of different key assumptions behind the two frameworks (e.g. predetermined diet in Ecosim as opposed to size-based opportunistic predation in Osmose), the magnitude of responses to the depletion experiments is generally larger in Ecosim than in Osmose, where ecosystem structure and functioning is more plastic and resilient. However, across both models and out of currently fished species, the depletion of anchovy has the highest ecosystem impacts: while it benefits other low trophic level groups (e.g. mesopelagic fish and sardine) through reduced competition on plankton resources, it is likely to affect higher trophic levels (including jumbo squid, seabirds and sea mammals) negatively as strongly suggested by simulations with Ecosim. 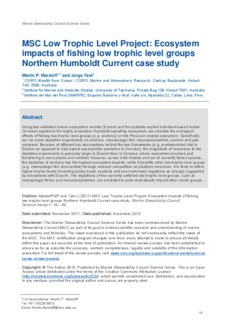 The depletions of the currently unfished low trophic level groups, such as mesopelagic fishes and macrozooplankton, are predicted to quite dramatically impact other model groups.